handmade / Local Love / sacramento / Words. Fresh faced Sacramento author Charles Passarell has not one but two books that recently hit the shelves. We think you should check them out. 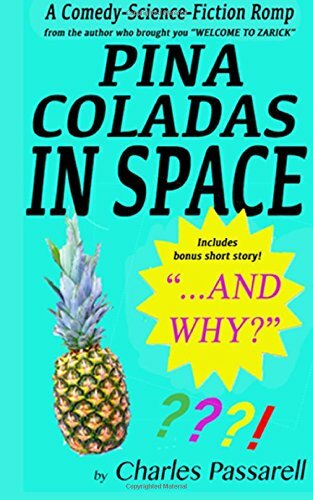 PINA COLADAS IN SPACE is Charles Passarell’s attempt to humorously parody the pulp science fiction stories of the 1960s. It is about an aging child actor and musician named Scott Garrows who gets abducted by a confused female alien and proceeds to adventure through space making cocktails and going on adventures. The book is full of many silly characters, like Scott’s pilot, Xelp, who is a three-legged fellow with the head of an armadillo and peculiar fondness for tie-dyed shirts and avoiding life threatening situations. The book also includes a short story called ….AND WHY? Which is about a philosopher’s quest to answer an odd question he receives at a book signing. Fans of Douglas Adams and Terry Pratchett should definitely pick up a copy of PINA COLADAS IN SPACE. WELCOME TO ZARICK was formed out of the idea of making Hunter S. Thompson a lead character in science fiction story. The book is about an orphan named Tommi Lawrence who has recently been kicked out of his orphanage. Tommi soon meets Ralph Morphso and becomes immediately intertwined in one of the crazy adventures that make of Morphso’s daily life. Complete with psychedelic drug trips, biker brawls, and an intelligent lizard named Fred, the book is sure to keep you entertained. 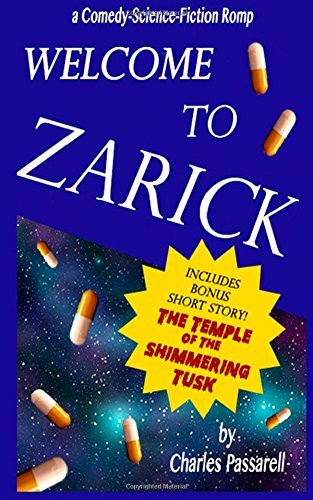 Also included is a short story called TEMPLE OF THE SHIMMERING TUSK about a crew exploring a planet they thought would be uninhabited by intelligent life. Their estimation turns out to be horribly wrong. The short story is meant to combine classical Hard Sci-Fi with pulp temple-exploration stories. Pick up your copy here. Tags: Charles Passarell, Charles Passarell amazon, Charles Passarell author, Charles Passarell books, Charles Passarell scifi, Charlie Passarell, classical, classical Hard Sci-Fi, comedy, new book, Passarell, PINA COLADAS IN SPACE, read, sci-fi, science fiction, scifi, TEMPLE OF THE SHIMMERING TUSK, WELCOME TO ZARICK. Bookmark the permalink.